The Victor Pinchuk Foundation was blasted in 2016 over their donation of $10 to $25 million to the Clinton Foundation between 1994 and 2005. The donations lead to accusations of influence peddling after it emerged that Victor Pinchuk had been invited to Hillary Clinton's home during the final year of her tenure as Secretary of State. Even more damning was Victor Pinchuk's participation in activities that constituted evasions of sanctions levied against Iran by the American government. A 2015 exposé by Newsweek highlighted the fact that Pinchuk owned Interpipe Group, a Cyprus-incorporated manufacturer of seamless pipes used in oil and gas sectors. A now-removed statement on Interpipe's website showed that they were doing business in Iran despite US sanctions aimed to prevent this kind of activity. Why John Bolton, a notorious war hawk who has called for a hardline approach to Iran, would take money from an entity who was evading sanctions against the country is not clear. It does however, raise serious questions about whether or not Bolton should be employed by Donald Trump, who made attacks on the Clinton Foundation's questionable donations a cornerstone of his 2016 campaign. HSBC is notorious for its extensive ties to criminal and terror organizations for whom it has provided illegal financial services. Clients that HSBC have laundered money for include Colombian drug traffickers and Mexican cartels who have terrorized the country and recently raised murder rates to the highest levels in Mexico's history. They have also offered banking services to Chinese individuals who sourced chemicals and other materials used by cartels to produce methamphetamine and heroin that is then sold in the United States. China's Triads have helped open financial markets in Asia to cartels seeking to launder their profits derived from the drug trade. Some of the terror groups assisted by HSBC include the notorious Al Qaeda. During the 2012 scrutiny of HSBC, outlets such as Le Monde, Business Insider and the New York Times revealed that HSBC had maintained ties to Saudi Arabia's Al Rajhi Bank. Al Rajhi Bank was one of Osama Bin Ladin's "Golden Chain" of Al Qaeda's most important financiers. Even though HSBC's own internal compliance offices asked for the bank to terminate their relationship with Al Rajhi Bank, it continued until 2010. More recently in 2018, reports have claimed that HSBC was used for illicit transactions between Iran and Chinese technology conglomerate Huawei. The US is currently seeking to extradite Huawei CFO Meng Wanzhou after bringing charges against Huawei related to sanctions evasion and theft of intellectual property. The company has been described as a "backdoor" for elements of the Chinese government by certain US authorities. Bolton's decision to accept money from HSBC given their well-known reputation is deeply hypocritical. HSBC's connection to terror organizations such as Al Qaeda in particular is damning for Bolton due to the fact that he formerly served as the chairman of the Gatestone Institute, a New York-based advocacy group that purports to oppose terrorism. These financial ties are absolutely improper for an individual acting as National Security Advisor. Like HSBC, Deutsche Bank has provided illicit services to international criminal organizations. In 2014 court filings showed that Deutsche Bank, Citi and Bank of America had all acted as channels for drug money sent to Colombian security currency brokerages suspected of acting on behalf of traffickers. In 2017, Deutsche Bank agreed to pay a $630 million fine after working with a Danish bank in Estonia to launder over $10 billion through London and Moscow on behalf of Russian entities. The UK's financial regulatory watchdog has said that Deutsche Bank is failing to prevent its accounts from being used to launder money, circumvent sanctions and finance terrorism. In November 2018, Deutsche Bank's headquarters was raided by German authorities as part of an investigation sparked by 2016 revelations in the "Panama Papers" leak from Panama's Mossack Fonseca. Two weeks after the 9/11 terror attacks, the Bush administration signed an executive order linking a company owned by German national Mamoun Darkazanli to Al Qaeda. In 1995, Darkazanli co-signed the opening of a Deutsche Bank account for Mamdouh Mahmud Salim. Salim was identified by the CIA as the chief of bin Laden's computer operations and weapons procurement. He was ultimately arrested in Munich, extradited to the United States and charged with participation in the 1998 US embassy bombings. In 2017, the Office of the New York State Comptroller opened an investigation into accounts that Deutsche Bank was operating on behalf of the Popular Front for the Liberation of Palestine. The PFLP is defined by both the United States and the European Union as a terrorist organization. It is ironic that Bolton, who is a past recipient of the "Guardian of Zion Award" would accept money from an entity who provided services to Palestinian groups that Israel considers to be terror related. Bolton's engagement in paid speeches, in some cases with well-known donors to the Clinton Foundation, paints the Trump administration in a very bad light. Donald Trump criticized Hillary Clinton during his 2016 Presidential campaign for speeches she gave to Goldman Sachs that were labeled by her detractors as "pay to play" behavior. John Bolton's acceptance of money from similar entities, especially the Victor Pinchuk Foundation, are exactly the same kind of activity and are an embarrassment for a President who claims to be against corruption. More broadly, John Bolton's work for the Victor Pinchuk Foundation, HSBC and Deutsche Bank shows that while he preaches hardline foreign policy approaches towards nations such as Iran and North Korea he has no issue tying himself to those who openly flaunt American sanctions and diplomatic attempts to pressure these states. For an individual who is the President's National Security Advisor to have taken money from banks who provide financial services to terror groups who have murdered thousands of Americans is totally unacceptable. Victor Pinchuk also gave money to Trump. A Ukrainian steel magnate, Victor Pinchuk, paid $150,000 to Donald Trump’s charity to book the then-presidential candidate to speak via satellite at a conference held in Kiev in the early days of the presidential campaign. “Victor is a very, very special man. A special entrepreneur,” Trump told the gathering. Trump also has close ties with Deutsche Bank.They loaned him money when nobody else would. In the midst of the New York attorney general’s and two different Congressional committees’ simultaneous investigations into President Donald Trump’s relationship with Deutsche Bank AG, the New York Times reported Monday that Trump received more than $2 billion in loans over the course of two decades. The Times interviewed 20 Deutsche board members and executives who said that the bank lent to Trump despite of multiple “red flags” waved by other financial institutions as well its own internal investigations between the late 1990s and 2016. According to the Times, Trump also tried to woo Deutsche bankers with private helicopter rides and promises of free weekend trips to play golf at his Florida resort Mar-a-Lago—which many now refer to as the “winter White House” due to the president’s high-frequency, highly scrutinized visits. But his promises didn’t always hold up, according to an anonymous Deutsche executive. The executive told the Times that Trump tried to rescind a Mar-a-Lago invitation he’d promised a group of the bank’s salesmen in 2003, after they’d successfully managed to sell hundreds of millions of dollars of Trump Hotels & Casino Resorts bonds in 2003. Although Trump ended up flying the salesmen to Mar-a-Lago, the executive said, his casino ended up defaulting on those very bonds the next year, costing the bank significant amounts of money. While that specific bank division stopped working with Trump, others continued. Even though a senior investment-banking executive told the Times that he warned management that Trump worked with people who were tied to organized crime and should be avoided, the bank lent him $500 million in 2005, according to the report. Years later, Deutsche continued lending to Trump even though two former executives told the Times he was found to have inflated his real estate assets by 70%. Deutsche finally denied Trump a loan he requested in 2016, during his presidential run. The bank reportedly feared that if Trump won and defaulted on the loan, it would have to decide between seizing the assets of a sitting U.S. president and not collecting his debt. For an individual who is the President's National Security Advisor to have taken money from banks who provide financial services to terror groups who have murdered thousands of Americans is totally unacceptable. Actually, he seems to fit right in since Trump dealt with those people and banks himself. Should Trump be fired for the same reasons presented in the OP (He also gave money to the Clinton Foundation) along with Bolton? Last edited by Zippyjuan; 04-10-2019 at 11:45 PM. Trump puts America First and rejects money from special interest, can you say same about neocons puppet Bolton? In October 2016, Trump’s son-in-law, Jared Kushner, “loaned” another $285 million from Deutsche Bank to refinance an existing “loan” on the old New York Times building, which Kushner had “bought” the previous year from Lev Leviev. The man currently in charge of the US Attorney’s Office for the Southern District of New York, interim US Attorney Geoffrey Berman, worked for more than 10 years at Rudy Giuliani’s law firm, Greenberg Traurig. Wilbur Ross (Trump’s Secretary of commerce), who worked decades at NM Rothschild & Sons, and Trump go back to at least the early 1990s when Ross, together with Carl Icahn, arranged the deal that allowed Trump to keep “his” casinos. Until 2012, the CEO of Deutsche Bank was Josef Ackermann. 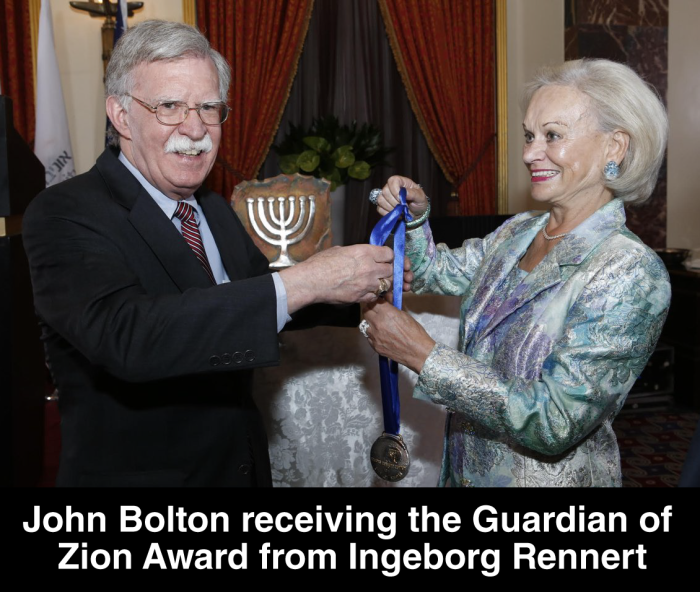 In 2017, John Bolton (before he became Trump’s NSA) was awarded “The Guardian of Zion Award” by Ingeborg Rennert. Only thing would add that besides Hillary, democrats are also bad.